An earthquake with a magnitude of 3.8 has been recorded in the East Midlands, the US Geological Survey has reported. The tremor was recorded near the village of Cottesmore, in Rutland, shortly after 22:25 GMT on Wednesday. People posting on social media reported buildings shaking in areas including Leicestershire, Rutland, Lincolnshire and Northamptonshire. It comes after an earthquake with a magnitude of 2.9 was recorded in Hampshire on Tuesday. The US Geological Survey, which monitors and reports earthquakes, said the epicentre of the earthquake was 2.36 miles (3.8km) from Cottesmore. The British Geological Survey, based in Nottingham, said it had received more than 200 reports from people who felt the tremor, including residents from as far away as Birmingham and Huddersfield. People posted messages on social media saying tremors were felt for around 10 seconds. One resident tweeted: "Think we have just had an earthquake in Oakham .... Deafening roar and much shaking. Ooooh er!" Sally Smart tweeted: "Earthquake wow that was a biggen!! Thought a truck was coming through the house #adrenalinepumping." BBC cricket correspondent Jonathan Agnew was also among those whotweeted about the tremor, saying: "The earth just moved in the Vale. I mean seriously. Anyone else feel it?" 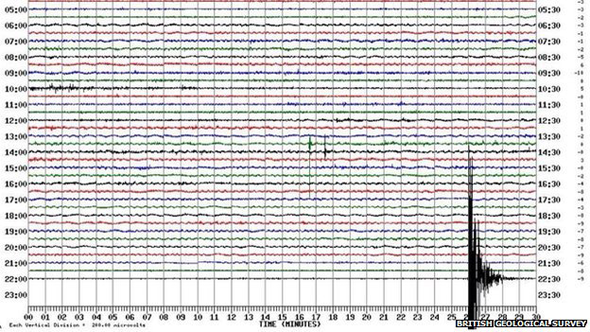 The tremor comes after two earthquakes were recorded near Oakham, in Rutland, in April last year. The first, recorded on 17 April, 2014, measured 3.2 in magnitude, followed by a second tremor the following day, which measured 3.5 in magnitude. On Tuesday, an earthquake with a magnitude of 2.9 was recorded in Hampshire. The British Geological Survey reported a tremor at a depth of 3km (1.9miles) at Headbourne Worthy, just north east of Winchester.